For my niece’s 16th birthday, most of my immediate family decided to come over to Cardiff for the day. As it was the blog’s first birthday sometime around the end of February, it was sort of a double celebration. After aimlessly wandering (at least to my mind) around various clothes shop in Cardiff during which my most frequent phrase was “How much? What for that!” (my view is £36 for a wafer thin t- shirt is just taking the p*ss). Apparently, based on this comment, I have no taste in clothes (guilty as charged) and no idea as to the cost of things. On the second charge, I say again £36 for a wafer thin t – shirt, the fabric of which probably cost all of 8 pence – add to that a bit of sweat shop labour and shipping costs, staff, shop rent etc and you may (at a push) get to £4.00. This equates to a margin that makes even the most shameless mark up on restaurant wine lists look reasonable. 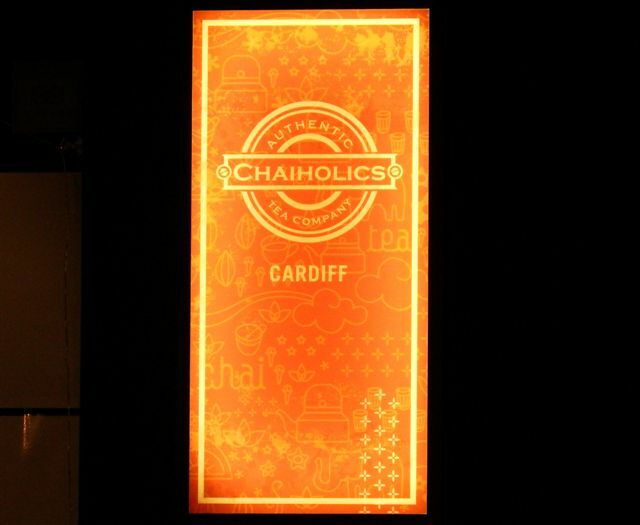 As your can probably tell, I loathe clothes shopping and it was with much relief that we eventually made our way to Chaiholics in the Roath suburb of Cardiff for an early supper (they had to get back to Somerset). My sister had seen the good write ups of Chaiholics on Tripadviser (her bible for going out etc.) and, having heard only good things about it, I wasn’t going to disagree with her (not that she would have taken any notice if I had). 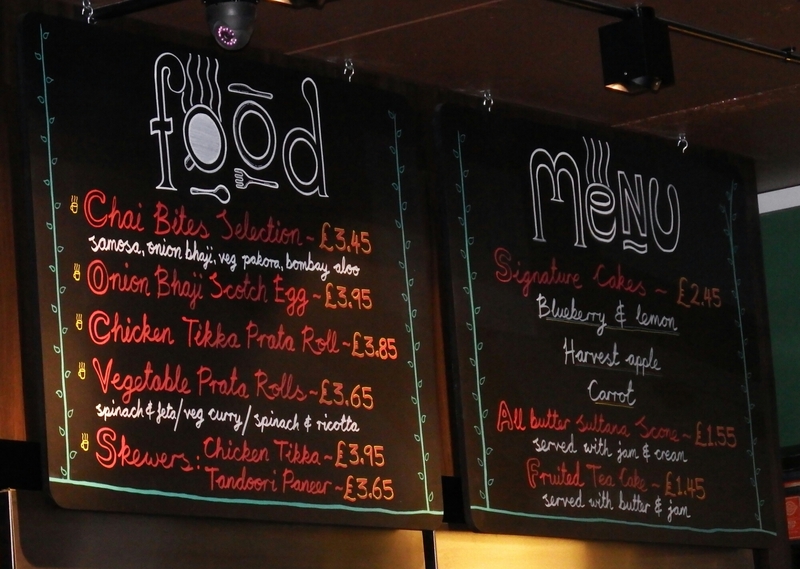 Tea house by day and Indian bistro by night, Chaiholics seems to seamlessly cater for both crowds. We arrived at 18.45 and there were a mix of people coming in for an evening meal and those still looking for a cuppa. 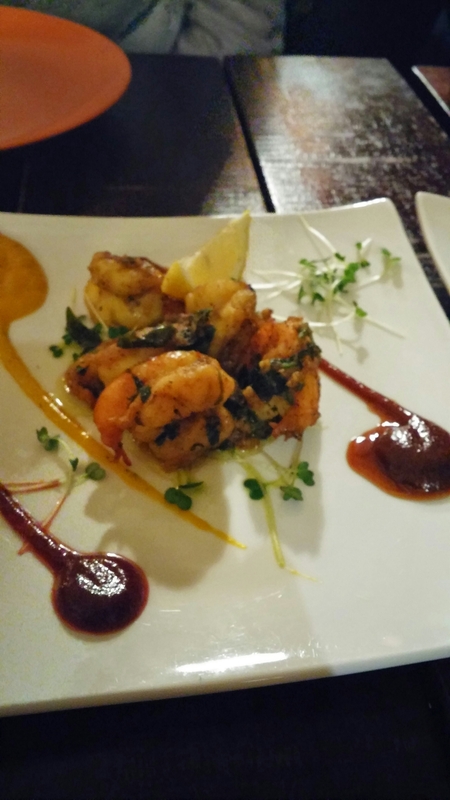 It is an inviting, cosy, informal sort of a place and we were made to feel at home immediately by the very friendly staff. I like the look and feel of the place very much. 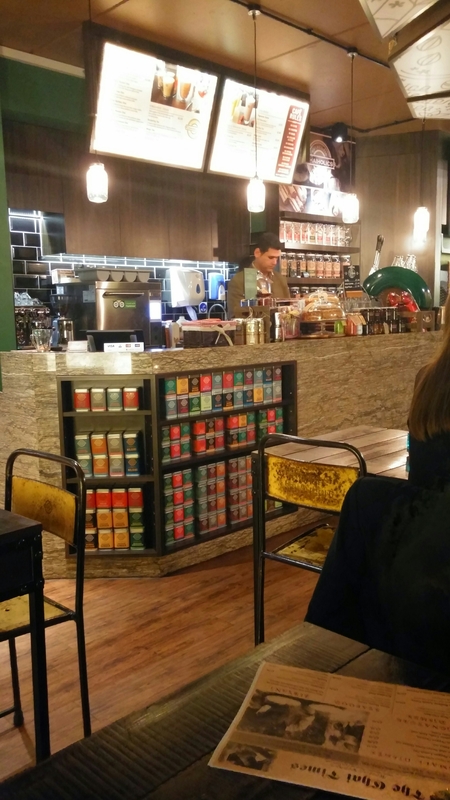 It would certainly become a regular haunt of mine if it were a bit closer to my neck of the woods in Cardiff rather than the other side of town. 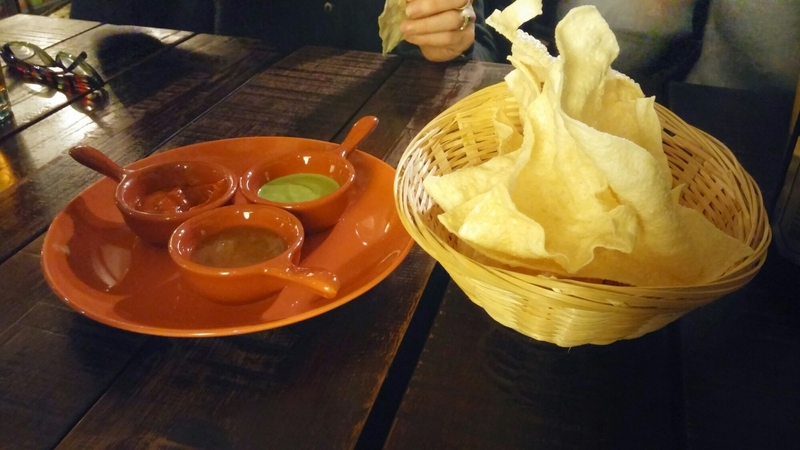 We started off with some nice poppadums (£2) which came with some decent (if a bit tame) pickles/dips. The black pepper lamb fry (£4.95) was meltingly tender and seriously delicious. Beautifully spiced, with pepperiness rather than heat, I loved this dish. Lemon pepper prawns (£5.45) were nicely cooked and well flavoured (didn’t get much lemon pepper mind), but I thought the portion size (quite dinky) made it not that great value for money (certainly in comparison to the other small plate dishes we had). The Keralan fried chicken (£4.45 – amusingly referred to as KFC on the bill, it was a million miles away from a “KFC”) came in bite size chunks which were more sticky than crispy. They had a nice spiciness to them and a lovely chilli afterburn. Very moreish. 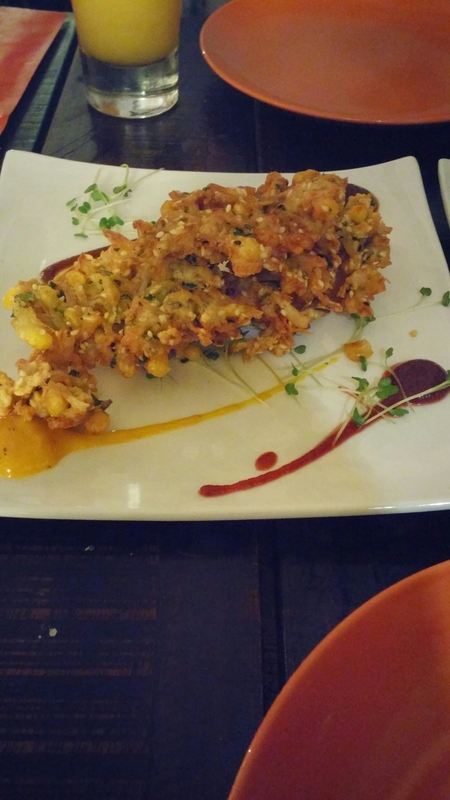 Last of the small plates were some potato and sweetcorn fritters (£3.45). Most of our party were not that fussed on these (finding the light spicing made them a bit bland), but I rather liked the slightly chewy texture they had. 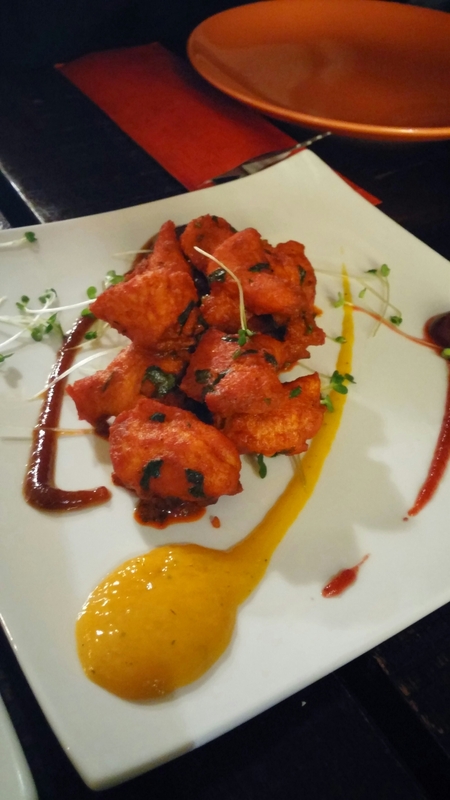 The main course menu is split between various sections which includes, somewhat unconventionally, burgers (with an Indian twist of course) as well as more expected items and some very inviting “Signature” dishes. 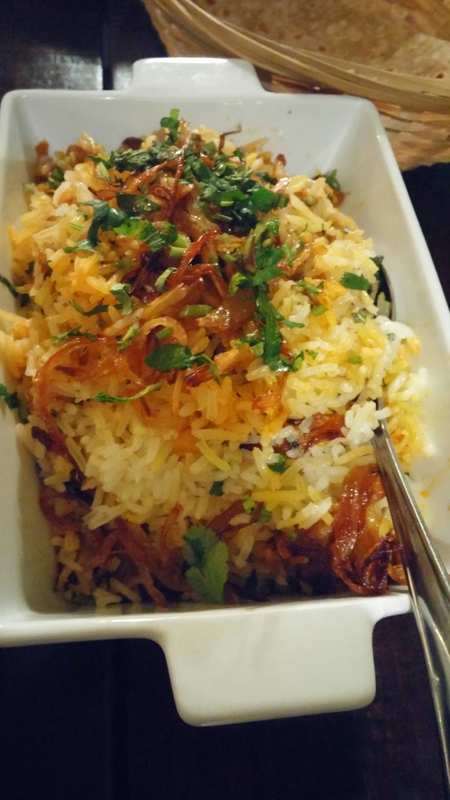 I went for a lamb biryani (£8.95), which was a very substantial portion and could have easily fed two people. The rice was perfectly cooked, fluffy with a lovely butteriness to it. Add to this some beautifully tender flavoursome marinated lamb, sweet onions, subtle aromatic spicing and a good thwack of fresh herbs and what I had was a very satisfying dish. Simple, but delicious. 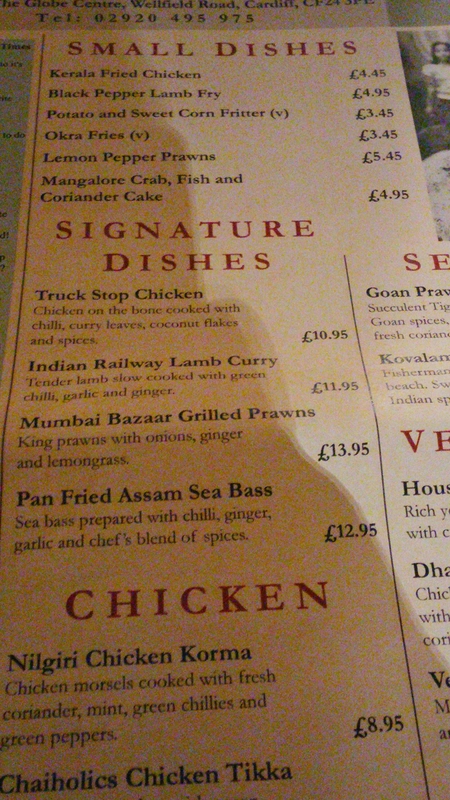 Although reference was made in the menu to it being served in a traditional pot, I think they must have run out. It certainly didn’t look very traditional to me. It’s deceptively large size ( the dish was quite deep) defeated me (usually a total pig, but I think I ate more than my fair share of the small plates selection) even after I had given out spoonfuls to others to try. Eating solidly didn’t seem to make even a dent in it. For the price it was seriously good value. I added to this a side of “roti” . 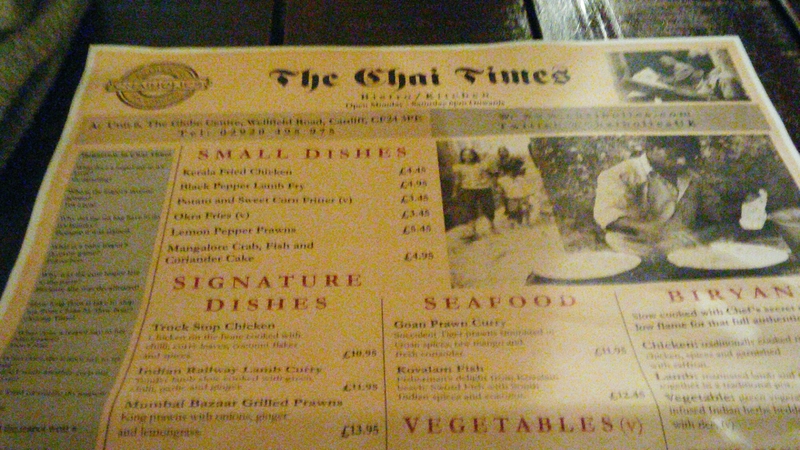 Nice as they were, I thought the £2.60 price tag for two chapatis was a bit on the steep side. 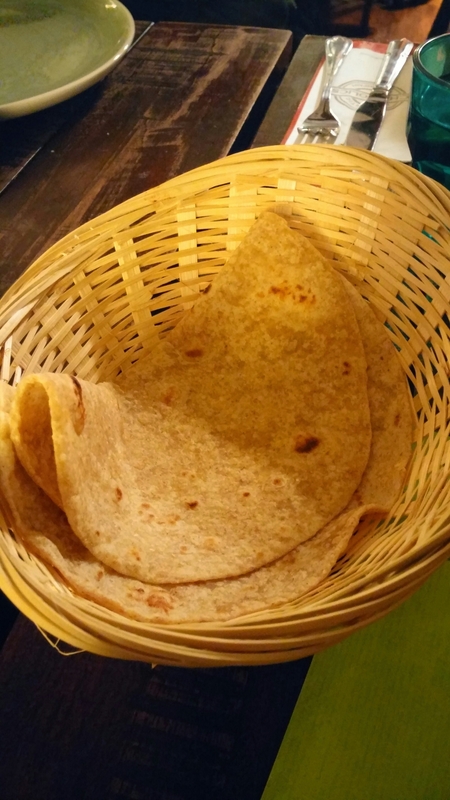 The chapatis also could have perhaps done with a dhal/sauce to dip them in – my fault re ordering. 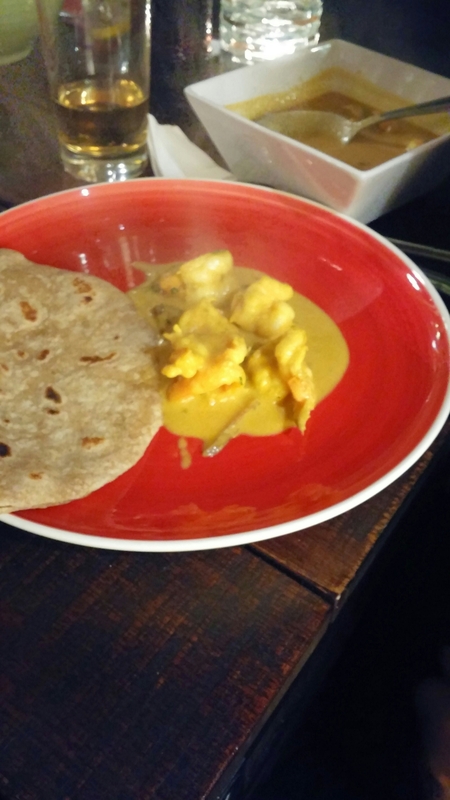 Kashmiri lamb ( £9.95 – no pic) and Goan prawn curry (£11.95). These all got a big thumbs up and I tried a smidgen of all three. 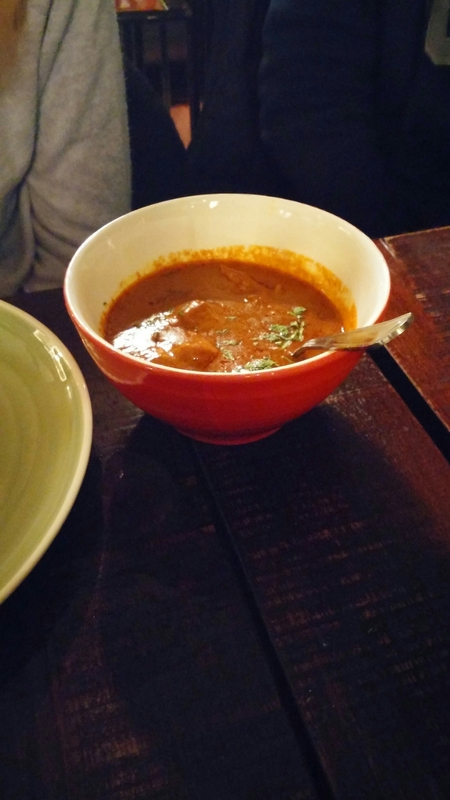 My favourite was the Indian Railway lamb curry which had a beautiful smokiness to it, but each one was very good. We all did suffer a tiny bit of food envy mind, when the table behind us had a whole pan-fried sea bass delivered. Boy did it look and smell good. It being a school night, with work the next day including a tricky early morning meeting, meant I skipped on the booze. 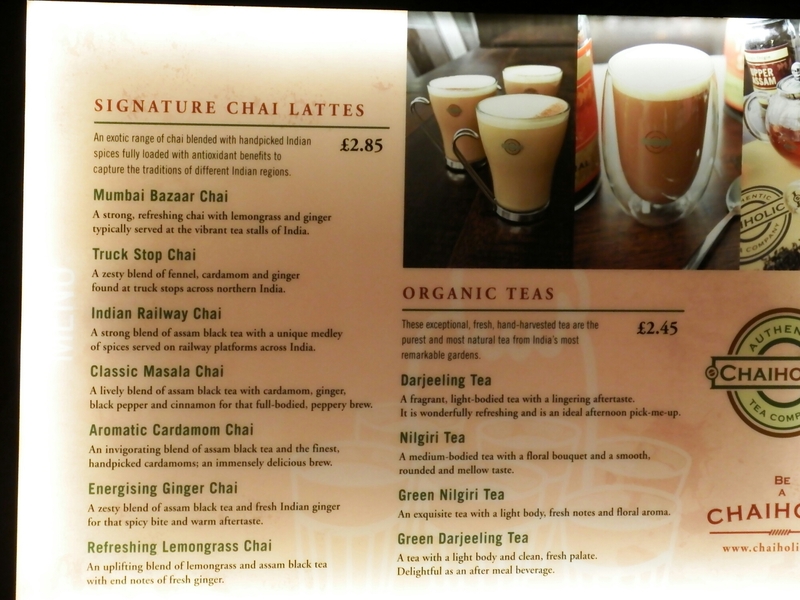 For those who don’t drink booze or don’t feel like it, Chaiholics (as is fitting of a tea house) has an excellent selection of hot and cold drinks, most of which are linked to tea. before finishing off the meal with a very refreshing green Darjeeling tea (£2.45). 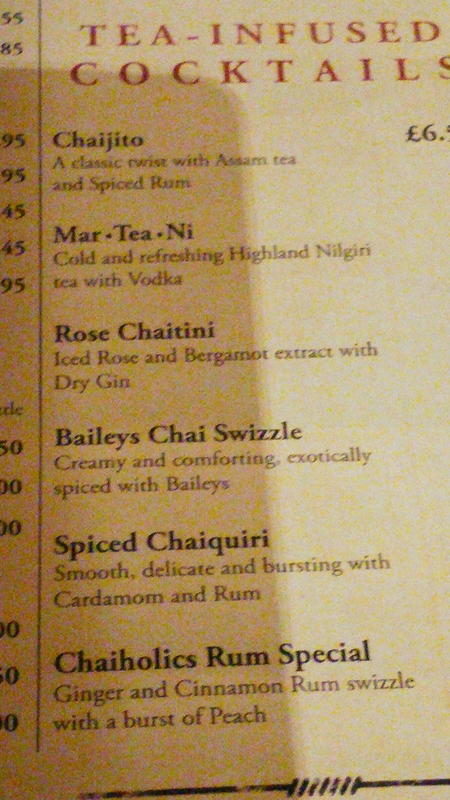 They do some nice sounding tea based cocktails, which must be good as they get the seal of approval from Cardiff’s tea guru, Cardiff in a tea cup, and a few beers (Cobra, kingfisher and Asahi). 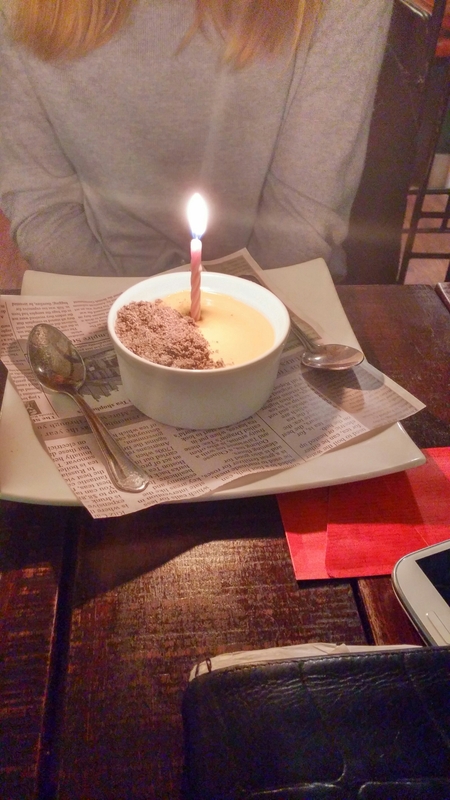 They really helped to make the meal a thoroughly enjoyable one, even bringing out a complimentary (and very nice) dessert (with a candle on top) for my niece when they overheard it was her birthday. They either really enjoy their jobs or are bloody good actors. 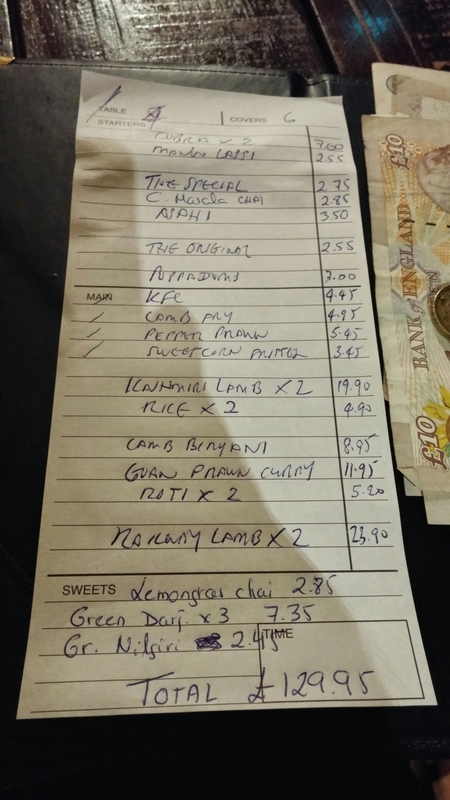 The damage (without tip) was a smidgen under £130 for 6 people, which I thought was good value for money as we did splurge a bit in terms of the amount we ordered. I liked the look also of their daytime menu. What is not to like about an onion bhaji scotch egg? 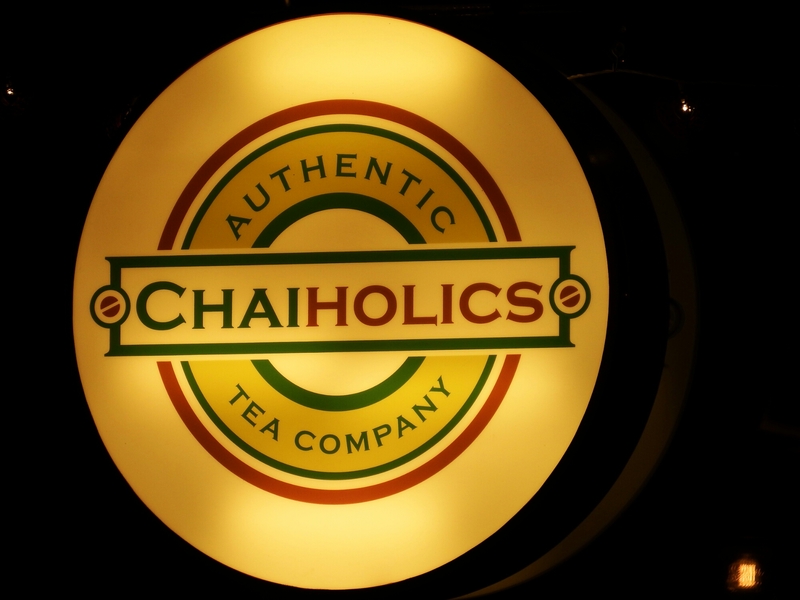 I really liked Chaiholics. 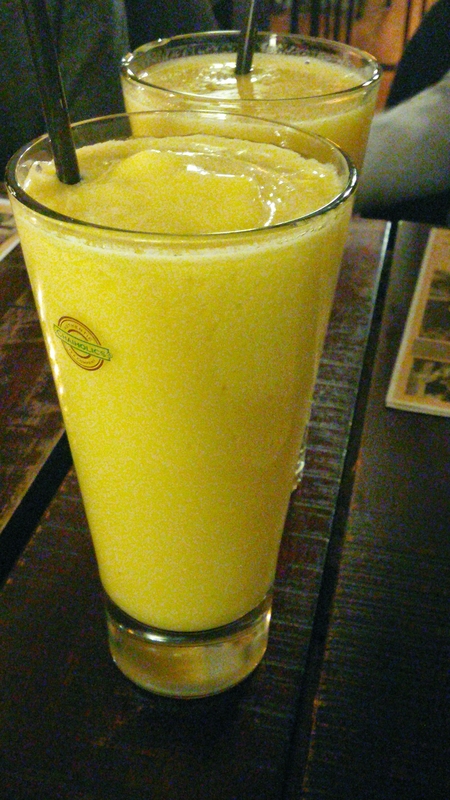 Great food, interesting beverages, good value and friendly staff made for a happy me. Would I go back? 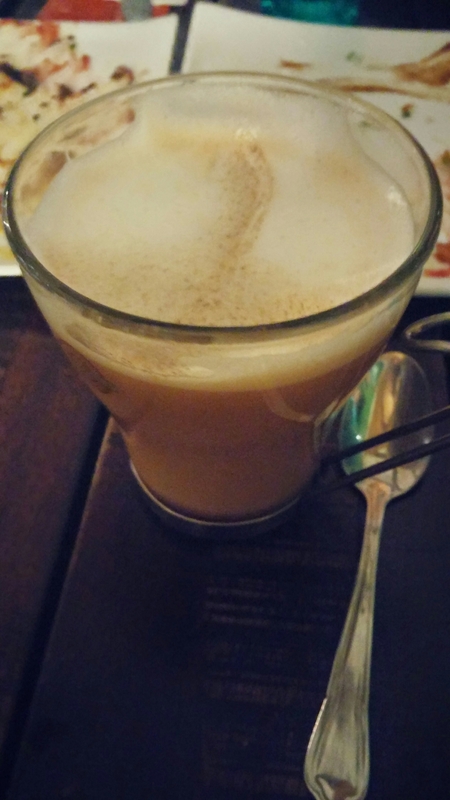 I am a Chaiholic – I have not been back for over two weeks and I seriously need to fall off the wagon and get another fix soon! So that is a big fat yes. Was truly fantastic and well described in this blog. What a great choice! 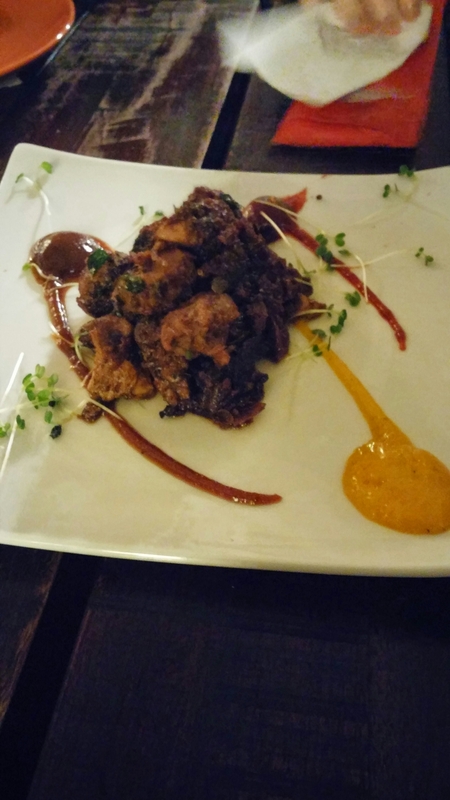 This entry was posted on Mar 8, 2015 by solicitingflavours in bistro, Cardiff, Chaiholics, Chilli, Curry, Drink, Food, Food and wine products, Fried chicken, Indian, Non alcoholic drink, Tea, Tea house, Wales.